Last Saturday on campus at Mississippi State during a defensive line drill, someone with the last name Dale left their mark on a tackling dummy. Ordinarily, there wouldn’t be anything unusual about such an occurrence. MSU lineman Torrey Dale is a massive man at 6-foot-6 and 277 pounds, so he packs quite a punch. Only this time, Torrey wasn’t the one doing the damage. It was his sister, Tatiana as part of the annual Mississippi State Women’s Clinic. For the Dales, last Saturday was a family affair. They got to spend valuable time with their brother and son. Though Torrey is about to begin his final season as a Bulldog, Celeste and Tatiana had never attended the MSU Women’s Clinic before. Thanks to the Facebook group True Maroon Bulldog Family however, Celeste learned about the clinic and joined a group of more than 75 True Maroon ladies at the event. The entire day was a roaring success. Tatiana recorded the fastest 40-yard dash time for her age group. The True Maroon ladies designed a shirt that won second place in the T-shirt contest, earning the group sideline passes to this year’s MSU game against Auburn at Davis Wade Stadium. While Celeste and Tatiana enjoyed seeing Torrey, other ladies from True Maroon made memories of their own. For several, experiencing the thrill of a Saturday in The Junction from a player’s perspective was quite the experience. “The highlight for me was being greeted and high-fived by the coaches as we exited our bus and made our way down the Dog Walk,” Angela Bridges of Grenada said. Dawn Traugott of Grenada, who was attending the clinic for the fourth time, agreed with Bridges. Something else stood out to Memrie Turner of Carrollton. 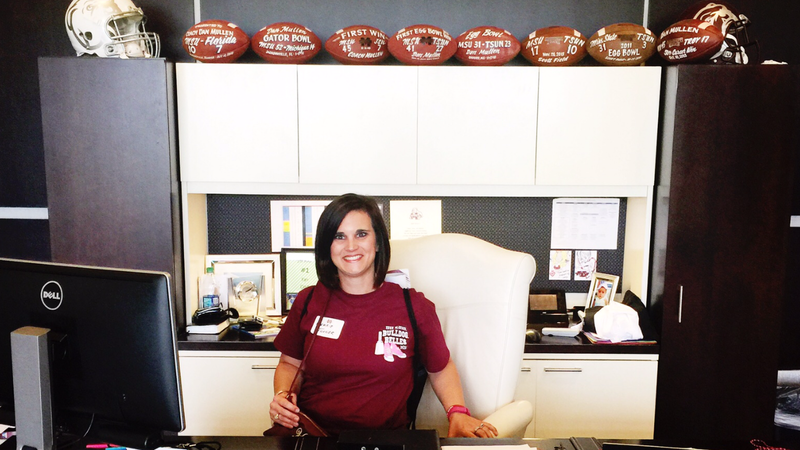 Attending her first clinic, Turner was peeking into the office of MSU head football coach Dan Mullen as the Bulldog leader ate lunch. While Bridges, Traugott and Turner won’t soon forget last Saturday, it might be hard to top the day Celeste Dale had. She came into the day knowing she’d see her only son. What she didn’t know was that he’d stick by her side all day long. 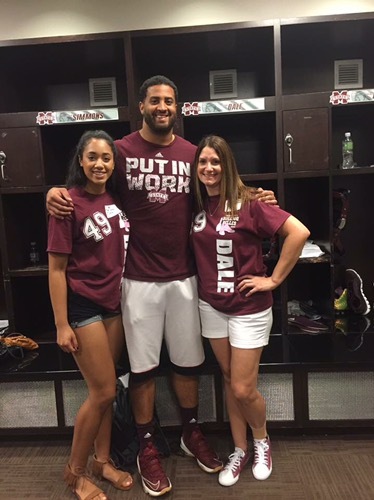 Turner might not yet have a son suiting up for MSU, but her day, too, was special. She’s already making plans for a return trip to the event. “I’ll definitely go back,” Turner said. It seems to be a common theme amongst the women of True Maroon. The clinic might only last a day, but the memories made will last a lifetime. July 28, 2016 in Football.